Some nights are better than others fantasy hockey fans. Everyone is quick to praise the best of the fantasy world but few hammer the worst like we do. 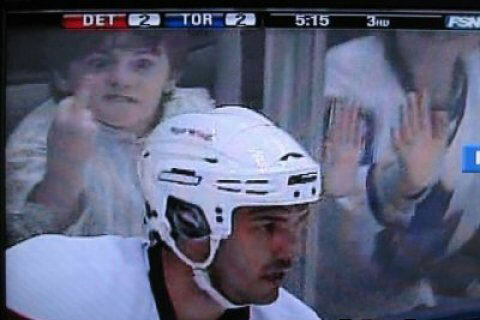 This little kid in Toronto had the right idea after all. Let’s give this guy the finger. He is just that much of a disaster tonight. The search from last night’s hockey games revealed that there was not much research to do when it came to that eye popping performance that screamed, “Oh god no!”. There are stat lines that oh…..okay let’s get to this. It is time to present tonight’s award winning recipient. Setting the world on fire like this is not the way to go son! Ottawa almost doubled Montreal up on shots and yet there was that middle part of the game where the Canadiens simply dominated the Senators on the scoreboard by scoring a whopping seven times in a row. By the way, Craig Anderson saw them all. Here was his simple stat line. There are few words to describe that other than ouch. I think the most telling illustration was seeing a friend’s fantasy goals against average balloon from 0.455 to 2.41, just from this one game. Just think Ottawa was up 3-0 in the first period and still lost 7-4 and no empty netters to boot. This one is going to sting owners of Anderson for awhile. It is a night that will be etched in memories when it comes to next year’s fantasy draft. That is almost a certainty. Who will top the list from a busy Saturday? You will have to watch to find out. If you have an F U candidate, just send it to us via Twitter @ChrisWasselTHW. Thanks for reading.